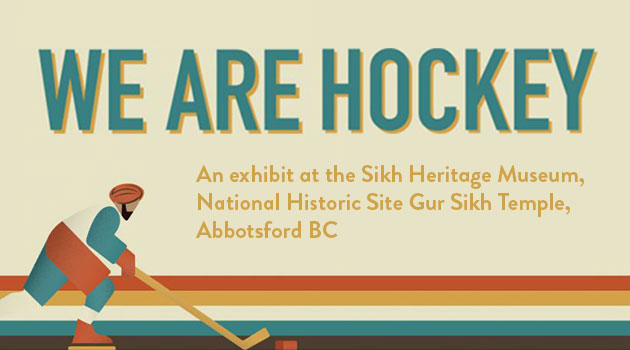 We Are Hockey is the new exhibit at the Sikh Heritage Museum, National Historic Site, Gur Sikh Temple — with an opening launch set for March 29 at 5 pm. The exhibit is curated to challenge the visitor to interrogate who the “we” is in Canadian hockey and the particular meanings of a very personal attachment to its iconic status for Canadians across the country. The South Asian Studies Institute (SASI) at the University of the Fraser Valley present this exhibit as a counter narrative to Canadian ice hockey as a ‘whites only’ sport. Curated on the experiences of peoples of colour, it challenges the linear meaning of hockey as Canada’s national sport. According to SASI Director Satwinder Bains, the exhibit features artifacts, memorabilia, photographs and stories that have great historical breadth reflecting the often conflicted laden Canadian responses to players of colour. “These players have often been relegated to the margins in favour of a popular understanding of hockey as a white man’s game,” Bains explains. Items include Manny Malhotra’s game-worn Canucks jersey, a timeline and history of players of colour in ice hockey, a centre stage set up for Hockey Night Punjabi, and much more. The opening reception on March 29 includes a Canucks Community Partnership, including a visit by Fin and giveaways. Special guests include Harnarayan Singh and Randip Janda from Hockey Night in Canada’s Punjabi edition. The main sponsor for this project is Rogers Media. National Historic Site, Gur Sikh Temple and Sikh Heritage Museum.